It’s not clear how many mirrors Bradley Wiggins smashed last week but he arrived in the starting hut for stage 8, the individual time trial, at the Giro d’Italia in 23rd place and a minute and a half down on general classification. Ahead of the race the prediction had been that Wiggins and Sky would target the TT to put time into his rivals for the GC and potentially take over the Maglia Rosa. Wiggins lost time after getting caught behind a crash earlier in the week but suffered a bigger setback when he slid of in treacherous conditions on stage 7. Rather than putting time into Vicenzo Nibali and Ryder Hesjedal, Wiggins faced the challenge of making time back up on them and hopefully riding back into contention. There was much speculation overnight; was Wiggins suffering from the same fever afflicting teammate Dario Cataldo? Had he injured himself in the crash? There was also discussion about which TT bike Wiggins would be riding for the stage. Wiggins had at his disposal the new Pinerello Bolide, rumoured to deliver a performance advantage over the existing Graal model. Wiggins had stuck with the Graal for the TTT in stage 2 but with so much more at stake it perhaps wasn’t surprising to see the Sky seek a ‘marginal gain’ from the prototype. With his fall down the GC on stage 7 Wiggins would be on the road much earlier than the other GC contenders but the time to beat had been set long before that. Riding his first ever grand tour Essex rider Alex Dowsett had taken his own Pinerello to the best time of the day so far at 1 hour 16 minutes. Dowsett, the reigning British TT champion was a Sky rider last year, moving to Movistar this year to increase his chances of riding in the biggest races. Dowsett had shared with followers on social media and via his rider diary on GCN that he had found his first week in his first grand tour hard going. This was reflected in his placing on GC ahead of the stage and the resulting early start time in the TT. Ahead of the stage Dowsett had shared his thoughts with GCN in the clip below. The Eurosport coverage lingered on Wiggins for much of his run thanks to his lowly starting position. All eyes were going to be on the first time check, early on the course in Pesaro. The first few kilometres of the stage were technical with more up and down and tight turns made harder by showers creating damp patches in places. Perhaps, lacking some confidence after the previous day Wiggins took a safety first approach early on and then bad luck struck again. On a gentle ascent Wiggins began pointing to his rear wheel before hopping off and tossing his mega bucks Bolide into the bushes alongside the road. Reaching the time check Wiggins was 7th fastest; potentially disasterous. The question now was could he make up time before the second check just before the final uphill drag. Of his rivals on GC fortunes were mixed. Nibali, who is no slouch on a TT bike was ahead of Dowsett on his split. Cadel Evans while not looking pretty was pretty effective. Hesjedal and overnight leader Intxausti in comparison were well down at the first check and it was hard to see them improving over the following longer stage. For Dowsett in the hot seat the emotions must have been conflicting. The realisation as more and more riders came in was that the possibility that he was on the verge of his first grand tour win in conflict with the race Wiggins was in with his teammate Intxausti. Wiggins crossed the final split in 4th place. It became clear later that Wiggins was the fastest rider over the second part of the stage. He had already overhauled a number of other riders on the course and dispatched a few more on the final climb. At the line Wiggins, his Rapha skinsuit covered in sweat from the effort, was 10 seconds down. Dowsett puffed his cheeks out and exhaled as perhaps the only man in the field who could beat his time failed to do so. As the top ten approached it became clear that the early efforts had had an impact, their times at the second check down on Wiggins and Dowsett. Hesjedal had a tough day at the office and crawled up the final climb all in from the effort. Inxtausti, admittedly not in a discipline that favours him, was even further down. Evans and Nibali faired better keeping their losses within a minute that would be reflected in the one-two on GC. For Wiggins, the stage was lost with the bike change, but he rode back into contention a second down on the podium place occupied by Robert Gesink. 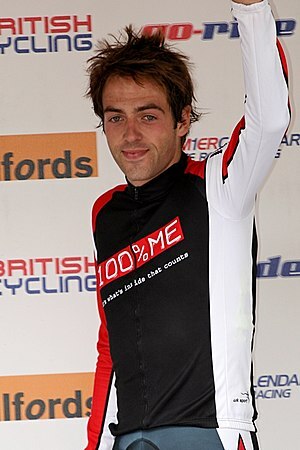 A great win for Dowsett although the wait for him must have been a nervous one. An unexpected win also perhaps, but one that puts another GB rider into the limelight alongside Wiggins and Cavendish on the Giro.